Just in: Five persons killed in Maiduguri suicide attacks – Royal Times of Nigeria. 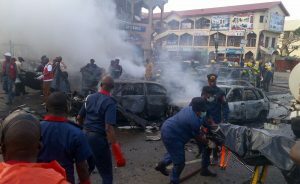 Five persons have been killed and eleven persons injured in three separate suicide attacks in Maiduguri on Wednesday. In a statement by the spokesperson of the National Emergency Management Authority (NEMA), Abdulkadir Ibrahim, the agency said the attacks occurred at three different spots.